In the early time people hunted small mammals and used their skin and meat, it was part of their daily life for many nations. In addition, rabbits, marmots hunted and special one is the corsac fox, with its reddish, highly insulating fur. Kazakh men have hunted from horseback with trained Golden Eagles, the largest and most powerful of raptors. Fox, rabbit and even wolf are hunted for their fur and for the challenge they present, pursued across the snowy mountains and steppes.However, in 21st century only in Western Mongolia you can find such hunters. In Kazakhstan and China there are also Eagle Hunters, but due to urbanization there is very small number of Eagle Hunters who hunt naturally in the steppe. In Western Mongolia, Bayan Ulgii province there are about 400 Eagle HUnters and they still practice hunting especially in winter time. This is the art and sport that involves a great deal of time and use of techniques that passed generation to generations. Hunter will get trained from childhood and it takes many years to be a good hunter. They should be able to choose a good pup from the nest. Origin of an eagle is also very important such as eagles from Chinese Altai, Xinjiang regions are one of the best eagles besides Mongol Altai eagles. 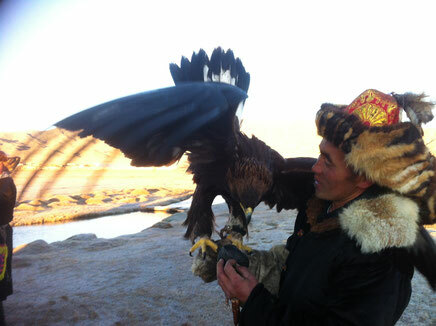 In Bayan Ulgii province hunters like to bring Balapan (eagle pup) from Delvvn soum(name of the region), Burged mouantins (Eagle mountains) southern region of Bayan Ulgii province. In addition, only female eagles are trained, they are larger and more powerful, and aggressive than males eagles. Depending on performance of an eagle, an Eagle hunter hunt with their birds up to 6 years. After an eagle must be released to breed in the wild.